Ductless Mini Split Installation St Louis - Expert HVAC Services! Ductless heating and cooling equipment is becoming more popular in St Louis area homes. Hoffmann Brothers was one of the first contractors for heating installation in the region to adopt ductless mini split heating and cooling systems. The ductless technology has been around for many years in Europe, but is newer to the states and more importantly St Louis, MO. Hoffmann Brothers heating contractors recommend the ductless HVAC technology for many types of applications including whole home heating and cooling, areas of the house that don’t get proper air flow, and when room additions to your property are made. If you are interested in a ductless mini split systems for your home, request a bid through our online form or call to schedule a free estimate with one of our experienced Project Managers at our St Louis heating office location. Ductless heating and air conditioning systems output both heat and air conditioning. With ductless heat and air, you can say goodbye to the internal ductwork within your walls and have the opportunity to control the temperature of each individual room. That translates into extremely efficient use of your hvac systems, turning units off as you leave a room, and adding heating and cooling units where it may not before have been ideal or even possible. How Do Ductless Heat Pump Systems Work? 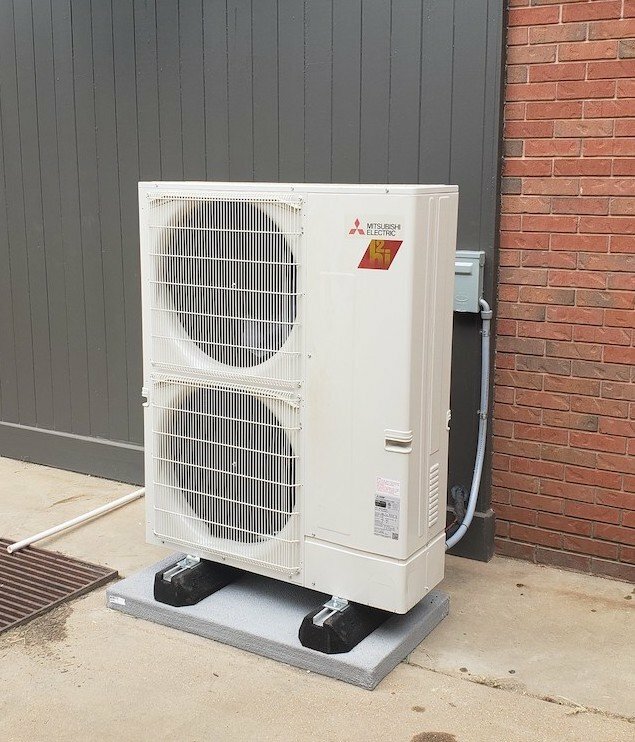 The Outdoor Unit: For a ductless mini split system, one outdoor unit gets linked to all indoor units throughout your property, utilizing the required refrigerant and wiring. The Indoor Unit: Each room you are seeking to heat or cool will have its own dedicated unit that can either be mounted on a wall or the ceiling. A separate individual remote will control the temperature for each room. The Remote Controller: With the simple touch of a button, the temperature of each room can be controlled. You’ll have the option to set it to heating, cooling, or automatic. The fan speed and direction can also be adjusted so you can control which direction the air blows. Ductless HVAC systems are extremely quiet while in operation. These ductless heaters are also one of the most efficient systems to install in your St Louis Home. We offer financing options for the installation of a ductless heating and cooling system, visit our financing page for more information. Our licensed and certified ductless mini split technicians are ready to begin your installation today! If you’re ready to move forward with reliable ductless heating and cooling systems in your home, call Hoffmann Brothers today at 314-664-3011 or request a bid through our online form.